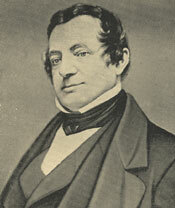 Washington Irving was born on April 3, 1783, the youngest of eleven children. During his early career, he studied law and travelled widely in Europe. He first began writing in journals and newspapers, and was editor of Analetic magazine from 1812 to 1814. Irving’s first book was a comic history of Dutch New York, which was published in 1809 under the pseudonym "Dietrich Knickerbocker", for which the Knickerbocker school of writers was later named. With the success of a collection of short stories, The Sketch Book Of Geoffrey Crayon, Gent., which included “The Legend of Sleepy Hollow” and “Rip Van Winkle,” Irving was able to write full time; the sequel to the Sketch Book, Bracebridge Hall, appeared in 1822. During the years from 1815 to 1832, Irving lived in various places in Europe, where he met Mary Shelley and Henry Wadsworth Longfellow and, while staying in Spain, wrote several historical books including two about Christopher Columbus. He returned to New York and was welcomed as the first American writer to receive international acclaim. He settled at Sunnyside manor in Tarrytown, where, except for his time serving as U.S. Ambassador to Spain, he spent the rest of his life. His later works include Mahomet and His Succesors and The Life of George Washington. He died on November 28, 1859, and was buried in Sleepy Hollow, NY. The adventures of Black Sam (Mud Sam), a black fisherman. The true story of Captain Benjamin L. E. Bonneville, who left for California in May, 1832, but was not heard from and was suspected to be dead. A narrative of western life, including a detailed description of the Native Americans. Ichabod Crane is sent to Sleepy Hollow to investigate murders. There, he falls in love with Katrina Van Tassel, is bullied by Brom Bones, Katrina's beau, and finds out that there are some things science cannot explain.